I love teacakes, I love a simple cake that goes with an afternoon coffee. This cake is simple, it is simple but delicious. The cake is lovely, my daughter says the cake part tastes like a cupcake. 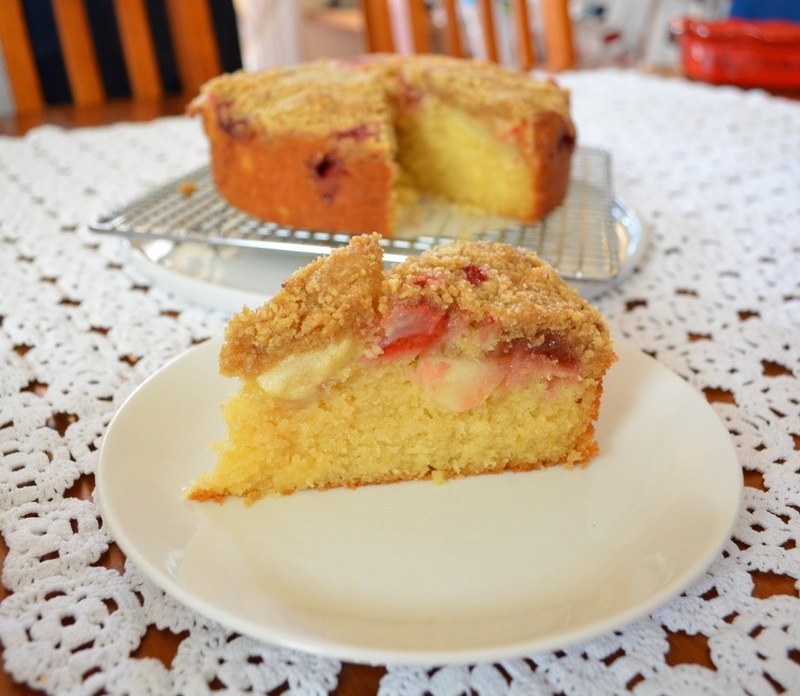 The fruit topping is lovely and the crumble on top is great. This is just one lovely cake. Not overly sweet, just perfect for an afternoon treat. Make sure you use a springform tin, I didn't and it is quite difficult to get the cake out of the tin if you don't. It can be done, but it is not ideal. It is best eaten warm, truly divine when it is warm, but once it has cooled, it is lovely to. Preheat oven to 180C/175C fan forced. Grease with canola spray oil (or melted butter) a 20cm round springform tin. Line the base with baking paper. Place the butter, sugar and vanilla in a large bowl. Using a hand held mixer (or freestanding mixer) beat until pale and creamy. Add both flours and the milk, using a metal spoon carefully fold the ingredients in until well combined. Spoon into the prepared pan, use the back of a spoon to smooth the surface. 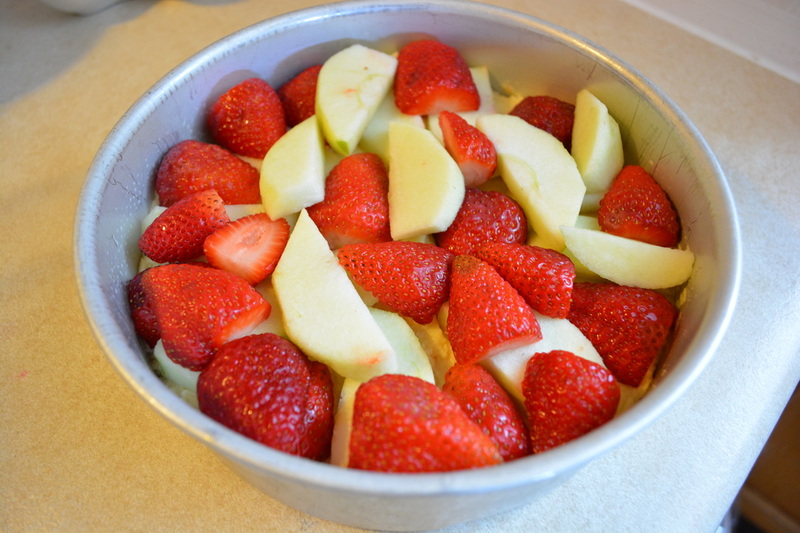 Arrange the apples and strawberries all over the surface of the batter. Food processor method: Place the flour, butter and sugar into a small food processor and blitz until you have a mixture that resembles coarse breadcrumbs. Fingertip method: Place the flour and butter in a bowl, use your fingertips to rub the butter into the flour until it resembles coarse breadcrumbs. Stir in the sugar. 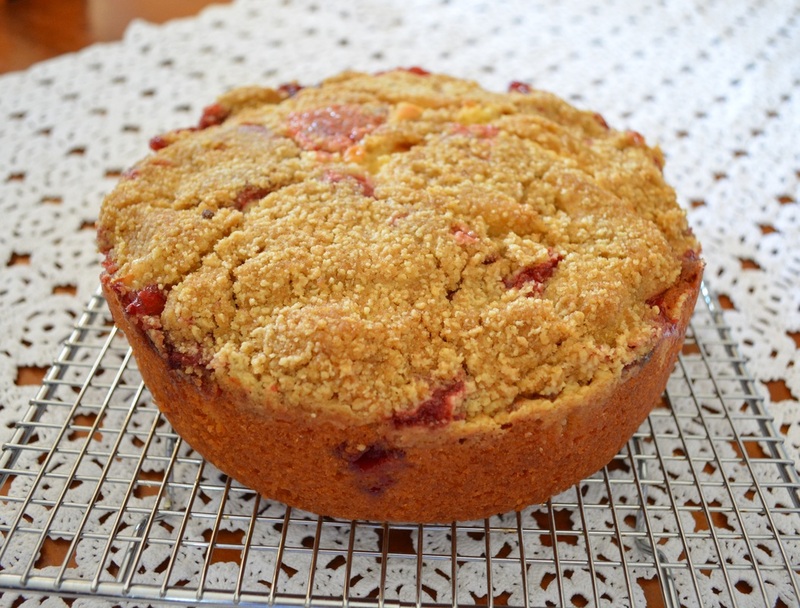 Sprinkle the crumble topping all over the apple and strawberries. Bake for 1 hour and 10 minutes or until a skewer inserted into the centre comes out clean. Allow to cool in the pan for 10 minutes before transferring to a wire rack to cool slightly.